Children become the author and illustrator of these little books. 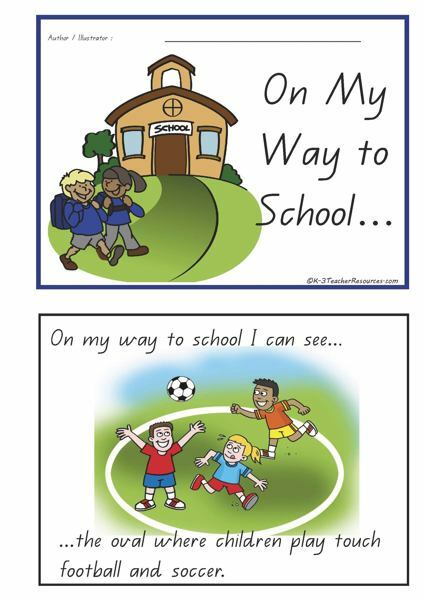 Fits in well with spacial awareness and maps as children map their route from home to school in a simple way. Ideal for use after a session on mapping your route to school – transfer 4 or 5 interesting things which can be seen from the route – make sure they are clearly shown on your map. Encourage use of lots of adjectives and descriptive sentence to differentiate – …..I can see… not just a shop – but the shop I sometimes go to on my bike to buy milk for Mum.